Shares of Nomura have jumped by as much as 9% following reports it plans to cut jobs and reduce the size of its European equity business. The BBC understands that its equity research, underwriting and derivatives businesses will be closed. Around 500 to 600 jobs in the US and Europe are expected to be lost in the downsizing, according to Reuters. 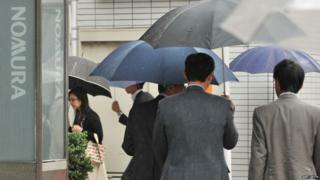 A separate report by the Nikkei newspaper said the potential cuts could be up to 1,000 jobs. Nomura said it would announce its full strategic plan on April 27 along with its annual results. "We are taking decisive action to refine the services we offer to our clients," Nomura chief operating officer Tetsu Ozaki said in a statement. "This exercise will deliver significant efficiencies and cost savings for Nomura, refocusing the firm's activities and reallocating resources towards its areas of expertise and most profitable business lines." Japan's largest brokerage has struggled to make profits from its overseas businesses and is said to be looking to reduce costs. Global investment banks have been scaling back their businesses as market volatility eats into revenues. Banks such as Credit Suisse, RBS and HSBC have cut jobs and either shut or sold non-core business units in recent years. Nomura had looked to bolster its brand overseas by purchasing Lehman Brothers' European and Asian operations after the US investment bank went under in 2008. However, the integration proved to be costly and Nomura undertook a major cost-cutting plan in 2011 to stem further losses. Nomura's third quarter net income fell by 49% from a year earlier to 35.4bn Japanese yen ($327m; £230m) because of market volatility. It has since undergone a senior management reshuffle, with its chief operating officer and chief financial officer being replaced last month.